Time will tell if this was a good result for Ireland. The fact that the away goal now changes from friend to foe adds another layer of tension to Tuesday's second leg in Dublin. On the eve of this game, Danish manager Age Hareide said he would be happy with a draw provided it was a scoreless one. And so it proved. No goals, no bookings, and a shortage of real drama. To pull out that old Shakesperean line about something rotten in the state of Denmark seems all too predictable. A bit like this game, truth be told. Regular observers of Martin O'Neill's Ireland knew it might pan out like this. A direct enough Danish side played their part too. They are able to handle themselves physically and managed Ireland's set piece threat; the guests succeeding in ending Christian Eriksen's goalscoring run. All those elements fed into this outcome. Eriksen was given the man of the match award by the Danish fans, but there were full-time boos from the Copenhagen crowd after a frustrating spectacle. In truth, Age Hareide's side only sporadically placed real strain on a solid Irish defensive unit that only really rode its luck on two occasions in each half. There was a late wobble that relied on a fine stop from Darren Randolph to deny sub Yussuf Poulsen but while large parts of the game were played in Ireland's half, red shirts struggled to make an impression in the Irish penalty area. 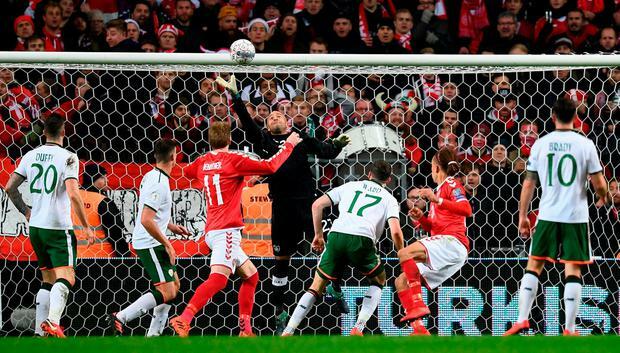 Martin O'Neill had predicted an early onslaught from the Danes but, while there was pressure, it was not as relentless as the first 15 minutes from Wales in Cardiff. Callum O'Dowda's inclusion on the right wing was the main pre-match talking point - he was given a pre-match pep talk by Seamus Coleman - but he was caught napping by a diagonal ball over his head that allowed left full Jens Stryger Larsen to test Randolph with a volley. The Irish keeper was then alert to gather the follow-up from Andreas Cornelius. Rebounds were the order of the day. Denmark's main opening came when a Eriksen shot was parried into the direction of Pione Sisto who steered wide of an open goal. That was a let-off for Ireland which stemmed from a poor CIaran Clark clearance that exposed a midfield that had pushed up. In general play, Ireland were compact with Robbie Brady and Jeff Hendrick sat close to Harry Arter with Eriksen's movement to the forefront of all minds. They were effective enough, although one passage of play where the Spurs playmaker got free sent O'Neill scurrying from the sideline to the bench for a long discussion with coach Steve Walford. Denmark's ideas well ran dry as the interval approached, though, with their fondness for sending bodies forward for long throws indicating there are similarities between themselves and the visitors. Kasper Schmeichel had to be alert to parry a close range effort before Hendrick dithered on the follow-up and the chance was gone. It would prove to be Ireland's best moment of the match. Still, that offered the substantial away support cause for half-time optimism, and the volume levels grew as the final whistle approached and Danish hope evaporated. Shane Long was summoned for Murphy and Glenn Whelan for the flagging Arter with containment the priority as full-time approached. The towering Shane Duffy did test Schmeichel from a late Brady free but the pendulum swung to the other end where Larsen outfoxed O'Dowda again and gave Poulsen the opportunity to make himself a hero. Randolph was equal to the task. Act Two will be decided by similarly fine margins.